Establishing healthy behaviors during childhood is easier and more effective than trying to change unhealthy behaviors during adulthood. Schools play a critical role in promoting the health and safety of young people and helping them establish lifelong healthy behavior patterns. Research shows a link between the health outcomes of young people and their academic success. 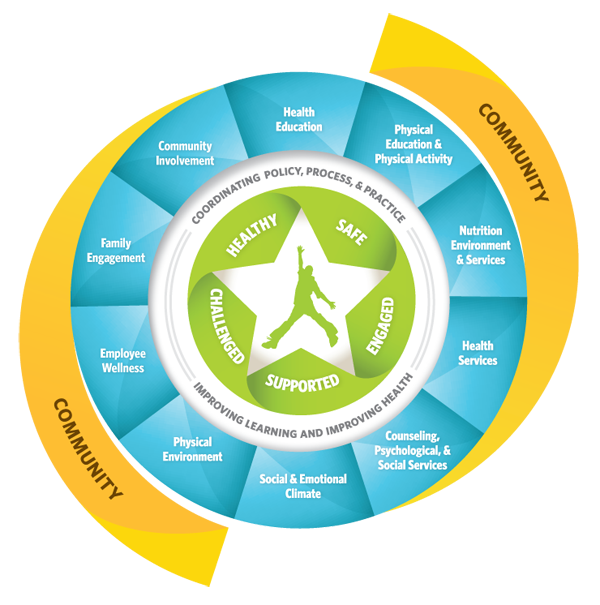 To have the most positive impact on the health outcomes of young people, government agencies, community organizations, schools, and other community members must work together through a collaborative and comprehensive approach. The Whole School, Whole Community, Whole Child (WSCC) model includes 10 components. This WSCC model meets the need for greater emphasis on both the psychosocial and physical environment as well as the ever-increasing and growing roles that community agencies and families must play. This WSCC model also addresses the need to engage students as active participants in their learning and health. CDC and ASCD developed the WSCC model—in collaboration with key leaders from the fields of health, public health, education, and school health—to strengthen a unified and collaborative approach designed to improve learning and health in our nation’s schools. The education, public health, and school health sectors have each called for greater alignment, integration and collaboration between education and health to improve each child’s cognitive, physical, social, and emotional development. Public health and education serve the same children, often in the same settings. The WSCC focuses on the child to align the common goals of both sectors with the tenets of a whole child approach to education.